Today I’m at Samsung SDS, Soul, I was invited to this wonderful event. Can you look at this ? It says “Open iT”. A Samsung SDS internal Agile conference. Thank you for inviting me to your conference. How about today’s event like ? It was much better than we expected, Obviously, because last time what we had was about 250 people. Today we had more than 500. 500! Wow, great. I didn’t see 500, but it was great. I was invited maybe because of this book. I wrote the book with Nonaka Ikujiro sensei, and this was translated by you, Myunggyo-san. I can speak Japanese better than English. 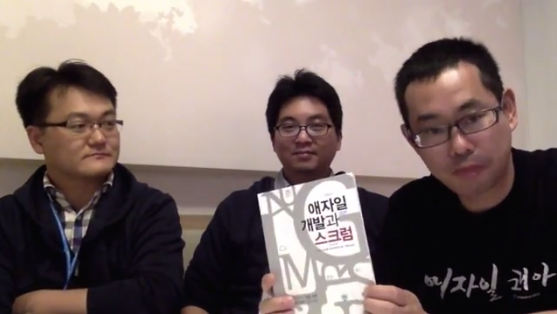 I had this opportunity to translate the original book, “Agile Development and Scrum” from a publisher, and it took 6 months to make the Korean version. 6 months! you are so fast. And finished. It has been published in Korea since July. Thank you for translating this book. My name is 신황규, Hubert Shin is my English name. And I’m the head of the event “Open iT 2014”. And, well, it was a great experience within this book, because there are a lot of practical experiences that I could use at work since we are people actually working as an Agile evangelist at Samsung SDS. It was great reference. And what I did on this book was … I personally started Agile for the first time at Samsung at the time I was very passionate about Agile. but at the same time, I was very worried about like… what if I could do something wrong. So what I did was I wrote a diary. What I could learn out of this experience was actually there was no such a thing like “we should do this if we want to follow Agile.” instead of that, I could learn something like continuous improvement is the most important thing when we do Agile. OK, I’m sorry there’s no Japanese version of his diary yet,..
Today I took part in OpeniT, it was a wonderful experience because young young people, they created by themselves this event together. It was such a difficult job because in this kind of organization… So many processes, policies, rules that we need to follow. But we kind of broke through and we achieved a lot of things for this event and one of the most important things, greatest things was we invited him. Thank you. It was a nice event and I really liked seeing people are shining, emitting their energy. I really liked that. And I saw that your vice president liked it very much too. I talked about it with her. OK, guys. Thank you very much for inviting me and translating this book. I’d like to have you in Japan, too.